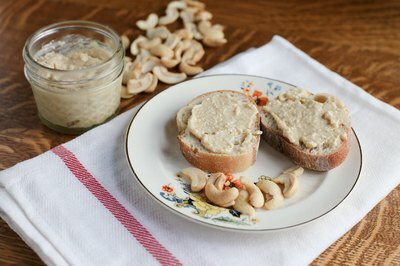 Cashew butter works as a substitute for peanut butter in a classic PB&J or stands on its own with savory vegetable ingredients in a pita. Add it to smoothies for extra body or to hummus when you don't have any tahini around. 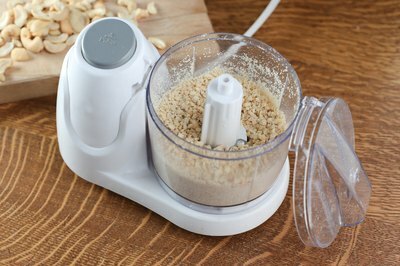 Whip your own up in a high-speed blender or food processor, using raw or roasted cashews. Roasted cashews result in a smoother butter with a richer flavor, because the oils are more readily expressed during the blending process. 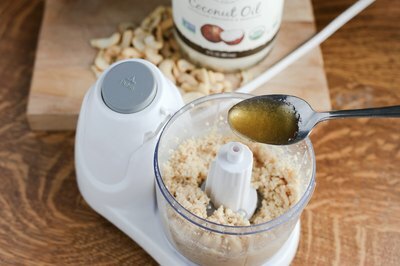 Your cashew butter will be ready in just a few minutes if you use a high-speed blender, but could take as long as 18 minutes when processed in a food processor. The cashews change in appearance as they turn to butter, going from a dusty, sandy mixture to a clumpy mess before eventually turning into a creamy paste. Regardless of which machine you use, scrape down the sides of the container once or twice during processing to get all bits smoothly integrated into the butter. Plan to process just 1 pound of cashews at a time -- using more may jam up any machine. Add coconut or flaxseed oil, a teaspoon at a time, to create a creamier consistency. You can also add salt and a little sweetener, in the form of honey, maple syrup or agave nectar. These liquid sweeteners may also lead to a softer, more spreadable cashew butter. Once you're comfortable with a basic cashew butter base, add other ingredients such as cinnamon, vanilla or even a little cayenne to punch up the flavor.